Programming standard for a particular company or project. This book defines a C++ coding standard that should be valid and usable for almost all programmers. ISO 9000 as well as the Capability Maturity Model (CMM) states that coding standards are mandatory for any company with quality ambitions. Developing such a coding standard is, however, a non-trivial task, particularly for a complex multi-paradigm language like C++. This book gives you a good start for a programming standard for a particular company or project. Such a standard is often written by the most experienced programmers in a company. If a quality manager responsible for the development of such a standard instead select this book as the base for the coding standard, experienced programmers can be relieved from this arduous task and instead continue to do what they prefer to do, designing the company products. This book should also be of great interest for quality aware C++ programmers trying to find ways of improving their code. 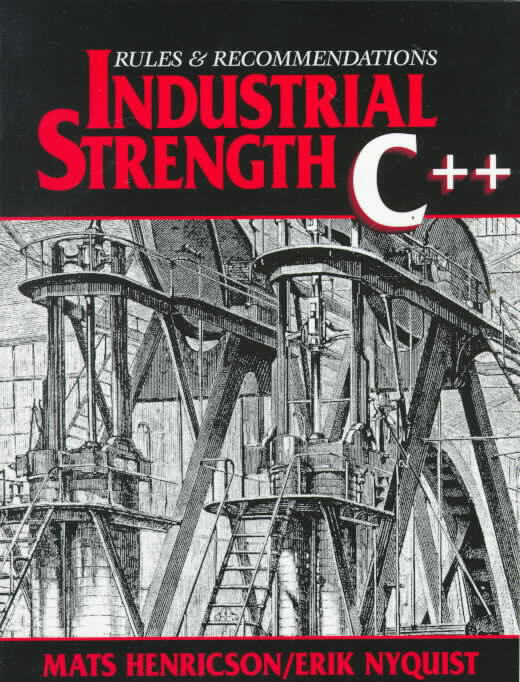 :) "Given the difficulty of writing a truly useful and reasonably comprehensive set of coding guidelines for a team or a company, I heartily recommend Industrial Strength C++."